Many people working in state and local government organizations face challenges in using information to do their jobs. They seek to use government information for program planning, monitoring, and evaluation, but struggle with a general lack of understanding of the nature and level of financial, technical, and human investments necessary to use information well. The Center for Technology in Government led an investigation into policies, data standards, costs, skills, strategies, and technical tools associated with effective information use in the public sector. Working with seven state and local agencies on projects with varying information use issues, CTG led each project team through the project definition phase while researching the factors that influence effective information use. The culmination of the findings are reflected in the Web-based practical resource The Insider's Guide to Using Information in Government. It presents, along with case studies from the seven projects, the management, technology, and policy issues that affected the agencies' efforts to effectively use and share information to fulfill their goals. Every day people inside government use information to develop policies, make decisions, evaluate programs and deliver services. But many face challenges in carrying out these tasks. The Using Information in Government Program was launched when state and local program and IRM managers came together to discuss the challenges they face in using government information for planning, operations, evaluation, and decision making. The workshop established a set of goals and framework for the two-year investigation that reflected their needs and ideas for effective information use within government. workforce issues including the increasing difficulty of attracting and retaining Information Technology (IT) managers and professionals to government service. Participants enumerated some goals and practical results they would like the Using Information in Government Program to produce. The following six program goals do not focus on a particular program area, but were considered among the top ranking concerns across all program areas. Recommend policies or policy templates to guide public officials in their use of government information. Comprehensive information use policies covered such topics as data collection, ownership, stewardship, intra- and inter-agency sharing and external release. Also, incorporating existing legal requirements. Data content and use policies should also be coordinated with related technology policies. Develop and assess data standards, inventories, and quality assurance tools. Participants noted the importance of the current data standards effort sponsored by the NYS Office for Technology, and suggested that the program develop data standards, definitions and inventories, and assess methods, costs, and benefits for creating and maintaining them. Develop and assess cost-benefit models and other measures of information value. Many participants were concerned that policy makers undervalue information as an organizational resource and a governmental asset. Specifically, they would like to identify mechanisms to measure and convey the value of information. Specify the information use skills necessary for government professionals and recommend ways to acquire them. Participants were concerned about the lack of skills necessary to effectively use government information, including ability to search, assess, analyze, and present information. They suggested a program goal of defining information-related competencies for program staff and research and IT professionals, as well as recommending education and hiring strategies. Assess the cost-effectiveness of various technical tools and techniques. Many information management tools are in use, or are under development in government and business. The program should explore the feasibility, cost-effectiveness, and appropriateness of various tools, such as databases, query tools, data warehouses, data marts, and data mining, for diverse business objectives. Develop collaborative and collective resources for data users. Participants identified several techniques to assist in achieving this goal, including a Web site which provides tools, tips, techniques, and contacts for those engaging in many kinds of data projects. In addition, a set of recommended practices based on real public sector experiences that address the policy, management, and technology issues to consider. Public management processes include internal controls, procurement, personnel management, rule-making, records management, auditing, and financial management. Policy analysis and evaluation covers such functions as research, planning, program development, evaluation, and reporting. Complex public service programs involves professional staff from one or more agencies in extensive service delivery, regulatory, or enforcement activities. Direct public contact includes publicly accessible information, referral services and directories; direct public access to reports and information; public participation processes; freedom of information requests; and simple transactions such as license and registration renewals or payment of fees and fines. 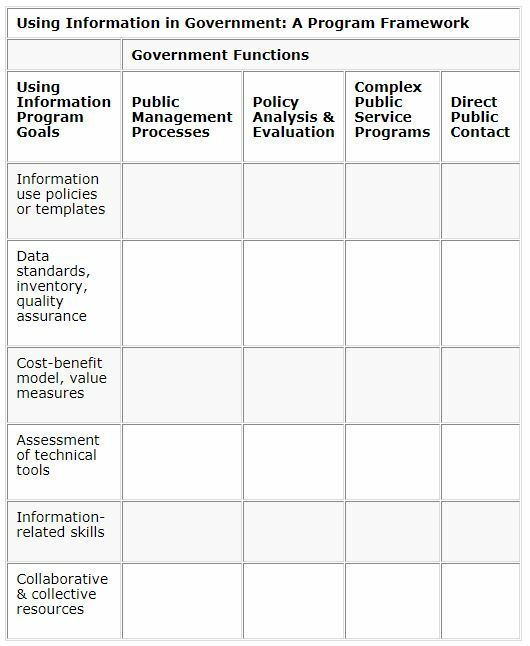 The conceptual framework for the Using Information in Government Program, shown below, reflects both this array of governmental functions and the list of program goals described earlier. The Program addresses not only one or a few cells in this framework but represents experiences and lessons across the full range of possibilities. What Rules Govern the Use of Information?